(Rachel Molenda | The Salt Lake Tribune) Narrators of Be One, an event to celebrate the 40th anniversary of the 1978 change that allowed black men and boys to hold the priesthood and black women and girls to enter LDS temples. The event was held at the LDS Conference Center in Salt Lake City, Utah, on Friday, June 1, 2018. 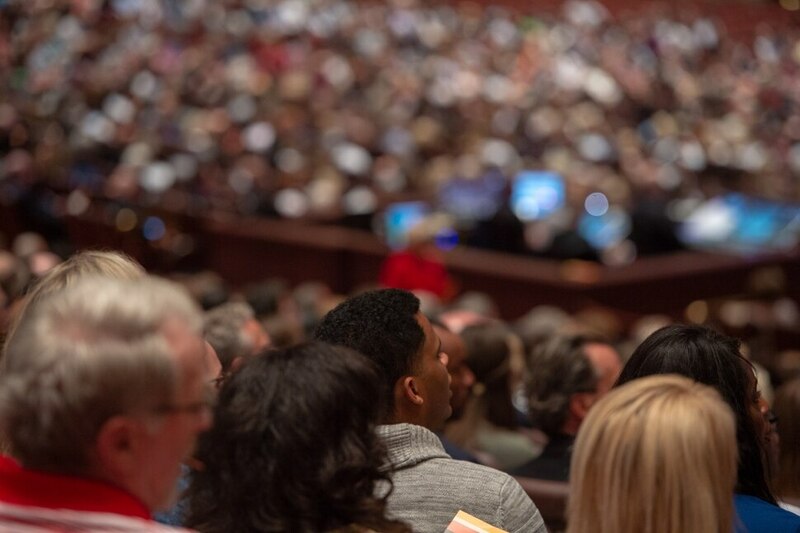 (Rachel Molenda | The Salt Lake Tribune) People stand as the Be One Chorus performs at the LDS Conference Center in Salt Lake City, Utah, on Friday, June 1, 2018.The First Presidency of the LDS Church sponsored Be One, an event to celebrate the 40th anniversary of the 1978 change that allowed black men and boys to hold the priesthood and black women and girls to enter LDS temples. (Rachel Molenda | The Salt Lake Tribune) An attendee sings along during Be One, an event to celebrate the 40th anniversary of the 1978 change that allowed black men and boys to hold the priesthood and black women and girls to enter LDS temples. It was held at the LDS Conference Center in Salt Lake City, Utah, on Friday, June 1, 2018. (Rachel Molenda | The Salt Lake Tribune) President Henry B. Eyring address the crowd at Be One, an event to celebrate the 40th anniversary of the 1978 change that allowed black men and boys to hold the priesthood and black women and girls to enter LDS temples. The event was held at the LDS Conference Center in Salt Lake City, Utah, on Friday, June 1, 2018. (Rachel Molenda | The Salt Lake Tribune) Alex Boyé performs with BYU Men's Chorus alumni at the LDS Conference Center in Salt Lake City, Utah, on Friday, June 1, 2018. The First Presidency of the LDS Church sponsored Be One, an event to celebrate the 40th anniversary of the 1978 change that allowed black men and boys to hold the priesthood and black women and girls to enter LDS temples. (Rachel Molenda | The Salt Lake Tribune) The Bonner Family performs at the LDS Conference Center in Salt Lake City, Utah, on Friday, June 1, 2018. The First Presidency of the LDS Church sponsored Be One, an event to celebrate the 40th anniversary of the 1978 change that allowed black men and boys to hold the priesthood and black women and girls to enter LDS temples. (Rachel Molenda | The Salt Lake Tribune) Tracy Browning reads the invocation at Be One, an event to celebrate the 40th anniversary of the 1978 change that allowed black men and boys to hold the priesthood and black women and girls to enter LDS temples. The event was held at the LDS Conference Center in Salt Lake City, Utah, on Friday, June 1, 2018. (Rachel Molenda | The Salt Lake Tribune) Alex Boyé performs with BYU Men's Chorus alumni at the LDS Conference Center in Salt Lake City, Utah, on Friday, June 1, 2018. The First Presidency of the LDS Church sponsored Be One, an event to celebrate the 40th anniversary of the 1978 change that allowed black men and boys to hold the priesthood and black women and girls to enter LDS temples. (Rachel Molenda | The Salt Lake Tribune) President Russell M. Nelson addresses the crowd at Be One, an event to celebrate the 40th anniversary of the 1978 change that allowed black men and boys to hold the priesthood and black women and girls to enter LDS temples. The event was held at the LDS Conference Center in Salt Lake City, Utah, on Friday, June 1, 2018. (Rachel Molenda | The Salt Lake Tribune) President Dallin H. Oaks address attendees at Be One, an event to celebrate the 40th anniversary of the 1978 change that allowed black men and boys to hold the priesthood and black women and girls to enter LDS temples. It was held at the LDS Conference Center in Salt Lake City, Utah, on Friday, June 1, 2018. (Rachel Molenda | The Salt Lake Tribune) Attendess of Be One, an event to celebrate the 40th anniversary of the 1978 change that allowed black men and boys to hold the priesthood and black women and girls to enter LDS temples, listen to speakers at the LDS Conference Center in Salt Lake City, Utah, on Friday, June 1, 2018. (Rachel Molenda | The Salt Lake Tribune) (Rachel Molenda | The Salt Lake Tribune) Dancers perform with BYU Men's Chorus alumni during Alex Boyé's set at the LDS Conference Center in Salt Lake City, Utah, on Friday, June 1, 2018. The First Presidency of the LDS Church sponsored Be One, an event to celebrate the 40th anniversary of the 1978 change that allowed black men and boys to hold the priesthood and black women and girls to enter LDS temples. (Rachel Molenda | The Salt Lake Tribune) Gladys Knight directs the Be One Choir at the LDS Conference Center in Salt Lake City, Utah, on Friday, June 1, 2018. The First Presidency of the LDS Church sponsored Be One, an event to celebrate the 40th anniversary of the 1978 change that allowed black men and boys to hold the priesthood and black women and girls to enter LDS temples. (Rachel Molenda | The Salt Lake Tribune) Gladys Knight directs the Be One Choir at the LDS Conference Center in Salt Lake City, Utah on Friday, June 1, 2018. The First Presidency of the LDS Church sponsored Be One, an event to celebrate the 40th anniversary of the 1978 change that allowed black men and boys to hold the priesthood and black women and girls to enter LDS temples. (Rachel Molenda | The Salt Lake Tribune) Alex Boyé performs with BYU Men's Chorus alumni at the LDS Conference Center in Salt Lake City, Utah, on Friday, June 1, 2018. The First Presidency of the LDS Church sponsored Be One, an event to celebrate the 40th anniversary of the 1978 change that allowed black men and boys to hold the priesthood and black women and girls to enter LDS temples. (Rachel Molenda | The Salt Lake Tribune) Attendess of Be One, an event to celebrate the 40th anniversary of the 1978 change that allowed black men and boys to hold the priesthood and black women and girls to enter LDS temples, listen to speakers at the LDS Conference Center in Salt Lake City, Utah, on Friday, June 1, 2018. (Rachel Molenda | The Salt Lake Tribune) The Be One Choir at the LDS Conference Center, in Salt Lake City, Utah, on Friday, June 1, 2018. The First Presidency of the LDS Church sponsored Be One, an event to celebrate the 40th anniversary of the 1978 change that allowed black men and boys to hold the priesthood and black women and girls to enter LDS temples. (Rachel Molenda | The Salt Lake Tribune) (Rachel Molenda | The Salt Lake Tribune) Dancers perform with BYU Men's Chorus alumni during Alex Boyé's set at the LDS Conference Center in Salt Lake City, Utah, on Friday, June 1, 2018. The First Presidency of the LDS Church sponsored Be One, an event to celebrate the 40th anniversary of the 1978 change that allowed black men and boys to hold the priesthood and black women and girls to enter LDS temples. (Rachel Molenda | The Salt Lake Tribune) Gladys Knight directs the Be One Choir at the LDS Conference Center in Salt Lake City, Utah on Friday, June 1, 2018. The First Presidency of the LDS Church sponsored Be One, an event to celebrate the 40th anniversary of the 1978 change that allowed black men and boys to hold the priesthood and black women and girls to enter LDS temples. (Rachel Molenda | The Salt Lake Tribune) Gladys Knight directs the Be One Choir at the LDS Conference Center in Salt Lake City, Utah on Friday, June 1, 2018. The First Presidency of the LDS Church sponsored Be One, an event to celebrate the 40th anniversary of the 1978 change that allowed black men and boys to hold the priesthood and black women and girls to enter LDS temples. (Rachel Molenda | The Salt Lake Tribune) President Russell M. Nelson addresses the crowd at Be One, an event to celebrate the 40th anniversary of the 1978 change that allowed black men and boys to hold the priesthood and black women and girls to enter LDS temples. The event was held at the LDS Conference Center in Salt Lake City, Utah, on Friday, June 1, 2018. (Rachel Molenda | The Salt Lake Tribune) Gladys Knight directs the Be One Choir at the LDS Conference Center in Salt Lake City, Utah on Friday, June 1, 2018. The First Presidency of the LDS Church sponsored Be One, an event to celebrate the 40th anniversary of the 1978 change that allowed black men and boys to hold the priesthood and black women and girls to enter LDS temples. (Rachel Molenda | The Salt Lake Tribune) Attendess of Be One, an event to celebrate the 40th anniversary of the 1978 change that allowed black men and boys to hold the priesthood and black women and girls to enter LDS temples, listen to speakers at the LDS Conference Center in Salt Lake City, Utah, on Friday, June 1, 2018. 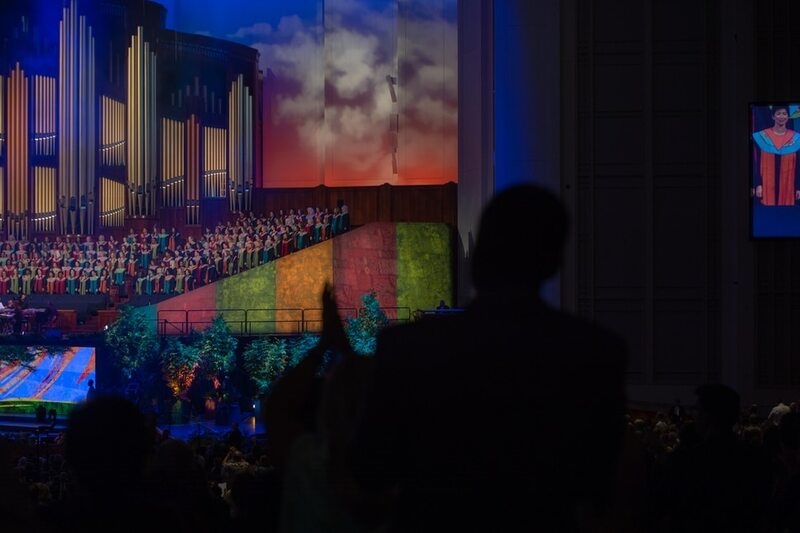 (Rachel Molenda | The Salt Lake Tribune) Performers on stage at the LDS Conference Center in Salt Lake City, Utah, on Friday, June 1, 2018. The First Presidency of the LDS Church sponsored Be One, an event to celebrate the 40th anniversary of the 1978 change that allowed black men and boys to hold the priesthood and black women and girls to enter LDS temples. Multiracial choirs accented in blue, purple, green, maroon and orange — swaying in unison in front of the massive organ pipes — rocked a packed LDS Conference Center in downtown Salt Lake City on Friday night in an animated gala celebrating the 40th anniversary of the end of the Mormon church’s centurylong ban on blacks holding the priesthood and entering its temples. 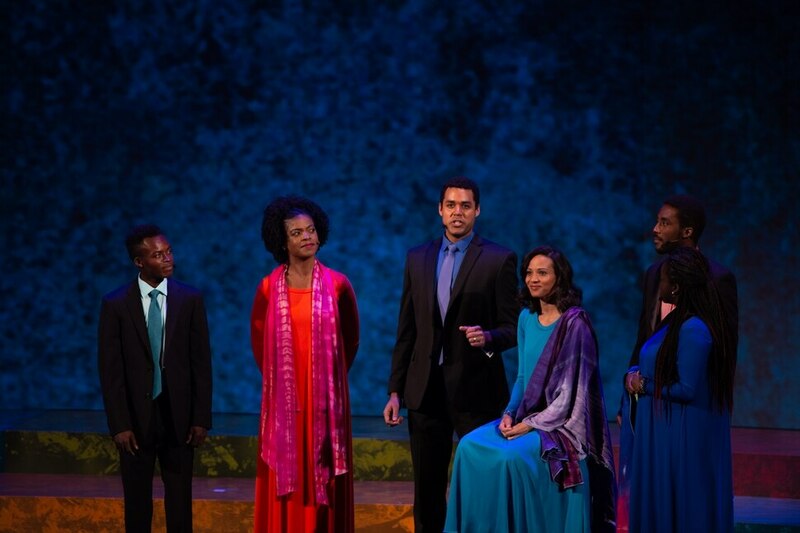 Latter-day Saints from various African nations as well as Brazil, Haiti, Jamaica and other countries, told of their pioneering paths, stories often punctuated by wild applause from the audience, including multiple standing ovations. The evening opened with a short speech by Dallin H. Oaks, first counselor in the governing First Presidency of The Church of Jesus Christ of Latter-day Saints, in which he extolled the June, 8, 1978, announcement of the “revelation” opening the Mormon priesthood “to all worthy males” and condemned continued racist attitudes. Then began a riveting narrative of not-often-told moments in Mormon history, narrated by members of African descent. It started with a joyous family circle in Africa, singing and dancing to the sound of drums. Then, suddenly, they are pulled apart, some staying symbolically on the continent, while others are yanked away in an allusion to slavery. LDS Church founder Joseph Smith’s “first vision” as a young boy began the reuniting of families, intoned the narrators. They mentioned the pioneering black convert Jane Manning James, who joined in the faith’s early days but was never allowed in the temple. They also featured Elijah Able, a black man who was ordained to the LDS priesthood and served three missions for the church, but was also not admitted to temple rituals. Both remained faithful Mormons to the end of their days. The extended Bonner clan, all dressed in white, mesmerized the crowd with a medley of LDS children’s Primary songs about families and love. Gladys Knight brought down the house with her rendition of “Somewhere” from “West Side Story,” each line — “we’ll find a new way of living, we’ll find a way of forgiving” — fraught with meaning for the performers and the multiracial Mormon audience. In his closing remarks, LDS Church President Russell M. Nelson first quipped that he wished for an encore, then ended the evening with a call for unity in diversity. Nelson finished his comments “in the name of Jesus Christ.” The audience said, “Amen.” And then burst into applause.